Upon first glance, Penn State appears to be a fairly typical college that is perhaps best known for football, fraternities, and fattening yet delicious Penn State Creamery ice-cream. My parents are both Penn Sate alumni, and three of my best friends currently attend the university. Yet if I am honest, I never really understood the appeal. To me, the school always felt like it had a sort of weird and cult like vibe to it, with the chants of “WE ARE!”, and the seemingly far too enthusiastic answers of “PENN STATE!” in reply. Maybe I am the weird one, but I was never one for school spirit, especially if it entails pretending to enjoy standing for over an hour at freezing cold football games. I am pretty certain you can have just as much school spirit sitting on the bleachers. Sure, tailgating with free cider and blue and white cake for breakfast is nice and all, but I just never understood why current students and alumni are so proud of this place lovingly nicknamed “Happy Valley.” While I could never imagine getting excited about football, there is one aspect that sets this university apart from other state schools. That aspect is the dance marathon that took place this past weekend called THON. 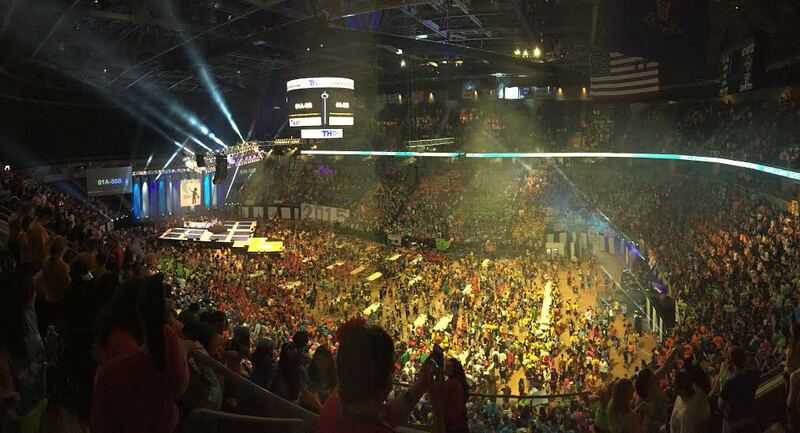 THON makes me extremely proud to be associated with Penn State and to have friends who took part in the event. THON takes place one weekend a year, but the movement is a yearlong effort to raise money for children with cancer and their families. The event lasts 46 hours in total and takes place at the Bryce Jordan centre on main campus. THON is largest student run philanthropic organization in the world, and this year students raised an incredible 13 million dollars in the fight against pediatric cancer. Families affected by cancer come and join in the dancing themselves as the uplifting environment provides them with an opportunity to finally relax for a little while and enjoy life. News outlets across America and celebrities like Khloe Kardashian tweeted in support of THON, proving how big this remarkable organization has really become. THON partners with the Four Diamonds fund to fight cancer at Penn State Hershey Children’s Hospital. Four Diamonds is the only beneficiary assocaited with THON. Sophomore at Penn State’s main campus, Kristen Pavlik, describes how it feels to be a part of THON by saying, “…THON has impacted my life by allowing me to feel like I have truly made a difference in other people’s lives… seeing the effects first hand with my special interest organization’s Four Diamonds family is tremendously humbling and inspiring.” I personally remember seeing pictures of Kristen in the rain with a can in her hand walking along highways collecting money. It sounds a bit serial killer-esque to describe it like that, but I assure you the money collected from this process of “canning” actually goes to save lives. “All of the work Penn Staters put into THON really makes us feel like a family…you know that everyone there [at THON weekend] made a huge difference in these children’s lives, and that would not be possible if it weren’t for Penn State.” Caitlin Monroe, another sophomore at main campus, is enormously grateful to be a part of such a far reaching organization.